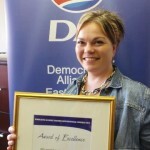 Gerrie Willemse was named legislature staff member of the year 2013 at the DA’s recent biennial provincial congress. She was secretary for MPLs Veliswa Mvenya and Edmund van Vuuren in the previous term and is currently support staff member for newly elected MPLs Celeste Barker and Vicky Knoetze. I started working with Gerrie from the beginning of the last term, from 2009 to 2014. She has triplets; she has no helper and served two members. During this period she also experienced a difficult time in her life due to a divorce. She was falling apart, but would close the door, cry and then continue with her work. She never used that as an excuse, she still performed. Gerrie is the strongest woman I have ever met. She balanced her work and her unhappy life, putting on a brave face. When assessing her PMDS I gave her the highest scores and it was easy for me to motivate this to the legislature’s panel. She is a secretary, but worked as a PA for both Edmund and I, which is very difficult to do. She also took responsibility to sort out problems with my house without complaining. My child never missed school, because when she missed her school transport, Gerrie was always there, whenever I needed her. If there is anyone who deserves a gold medal, it is Gerrie. Congratulations for a well-deserved award. Keep up the good work. I am so proud of you! May God richly bless you and help you raise your kids to be whatever you wish for them. There is light at the end of the tunnel. Be patient. Shadow Education MEC Edmund van Vuuren said Gerrie handled one of the toughest and most demanding portfolios, namely education, with aplomb and dedication. This is why I have been able to do well in this portfolio. She always reported back to me and spent a lot of time resolving queries. I mentored her, and because Gerrie worked so hard in this portfolio, she has been an excellent mentor to my new secretary, Nalisha Dhaya. Gerrie really deserves this award.